Orchid cacti, like this one housed at a library in Illinois, bloom just once a year. It’s Monday, around 9 o’clock, and the library is locked for the night. Silently, Linda Zellmer appears on the other side of the glass door. She opens it and guides us up four dark floors towards a puddle of light. Zellmer perches on a stool behind her camera and waits in anticipation of the night’s big event: the moment when the bud opens. The orchid cactus flowers in hopes of reproducing. Its’ strong, sweet smell meant to draw pollinators, like birds and bugs, close. This particular Lady of the Night lives a solitary life, rooted in a small pot under the shadow of an umbrella tree. But tonight is its one chance to do what it was meant to do: spread its seeds. “It is a very, very showy flower,” Zelmer says. “Things have to be totally right to bloom,” she says. Zellmer, a librarian at the Leslie F. Malpass Library at Western Illinois University, spends her days reading academic journals and deciphering maps. When she takes a break, she likes to leave her cluttered office and sit in the building’s common area, amidst the thousands of potted plants the library houses. Malpass Library opened in 1976 and was arguably designed more for plants than for books and people. Made mostly of glass, the library is humid and prone to molding. Its’ six stories are built around a central atrium crowned by a fifteen-foot-tall fig tree. Every nook and cranny is filled up, forcing patrons to duck under hanging pots of ferns and squeeze in between bookshelves and the century old jade plant. The orchid cacti first caught Zellmer’s eye last August when one of the library’s three specimens threw off several buds. As students and faculty celebrated outside during the university’s welcome back party, Zellmer sat alone in the library, watching. The scientific community recognizes a man named A. P. de Candolle for first discovering the plant in 1828. In the nearly two centuries since, its beauty has been mythologized by epic poets and its essence bottled. Some cultures claim orchid cactus stem extract works as a cough suppressant, while others cook the petals into a soup that’s assumed to be an aphrodisiac. In Southeast Asia, it’s revered as a sacred home to the Hindu god Brahma and it’s believed if you pray while it’s blooming, you’re prayers will be answered. In the U.S., the plant is popular among gardeners (scroll halfway down the page) who invite friends over for bloom night, pour wine, and watch. In early May, Zellmer noticed it happening again. 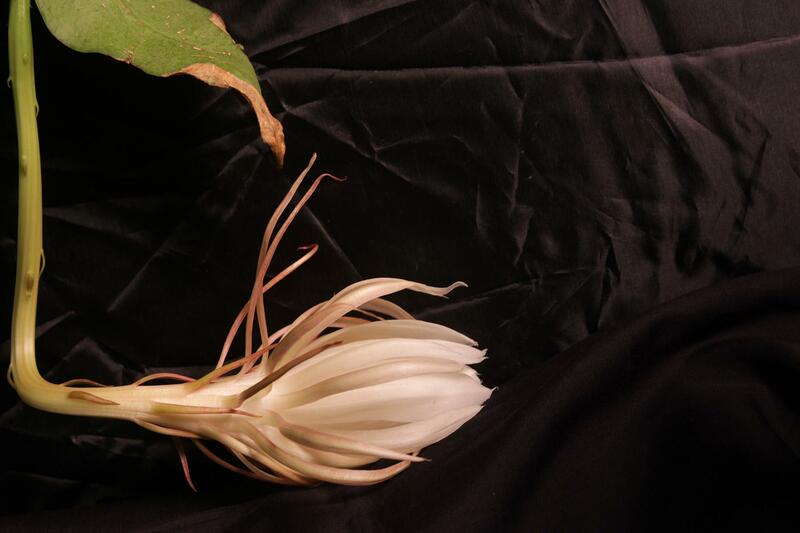 The orchid cactus on the fourth floor began pushing out a single green bud that hung down from its fleshy stem. She photographed as it extended four inches long. Then, she says, it stood up - eager for birds and bugs to swoop in and collect some of its pollen. In its native habitat, stretching from the sub tropics of Mexico to the rainforests of South America, the orchid cactus would never touch the ground. Instead, it clings to the branch of a tree forty to sixty feet up where it can grow 20-feet tall, wrapping its’ roots around the tree’s trunk and feeding on sunlight, rain, and air. Perched in the rainforest canopy, the flower blooms bathed in moonlight amidst the whirl and buzz of nightime creature life. At 10 o’clock, it starts to happen. First, the bud’s outermost petals peel back - wiry and pink. Then, the middle layers fringe and part, long and thin like a piano player’s hand. Next, the flower’s central blossom balloons and its wide, opal petals start to unravel. By full bloom, they’ll stretch to the size of a dinner plate, revealing a beaming white, almost iridescent, center. At this point, the blossom is literally throwing off heat; its warmth a siren's’ call to the forest’s hummingbirds, bats, and moths. If the orchid is lucky, one of these nighttime flying creatures will be covered in pollen from another orchid cactus. As the creature dips into the base of the petals for a sip of nectar, the pollen will brush off on the flower’s frilly stigma and trickle down a long tube, called the pistol, into the flower’s center, fertilizing the tapioca-like embryos inside. Then, the plant can bear forth a big red fruit, filled with orchid cactus seeds. But that never happens for the orchid cacti in Malpass Library, which attract people, not pollinators. “Ours have never produced fruit because they never get pollinated,” Zellmer says. A little before midnight, Zellmer packs up and heads off. By the time she returns for work tomorrow morning, the blossom will be spent and the cactus will look like just another plant in the library.